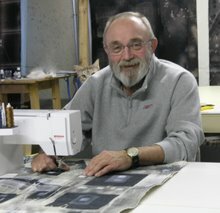 A blog about art quilts, quilt shows and classes, starving quilt artists, and other related topics. There will also be some unrelated topics. We will talk about things we know. We have a great source of health and fitness information. Bob has several classes coming up in 2011 that are out of the country and this might be the best place to explain what he means when he asks for sandwiches. Mine would be egg salad but he is talking cloth, batting, cloth sandwiches. There are pictures that will explain what he means if you look at older blogs. I will be adding new pictures from his classes at QSDS and Australia. We have been so busy with life that I have let this page slip. I would say I was sorry but now that I have grand kids, they are taking up my time and energy. We had a wonderful winter in California last year from October through April and we will be heading back for a quick trip soon. We are trying to decide what to do with our life now. 2011 will be Bob's busiest year for teaching and we are thinking of selling the house and downsizing to California. IF we end up doing that we will have to sell a lot of Bob's possessions. One that comes to mind is his George (APQS) sewing machine and table. We would be downsizing to a one bedroom apt. from a 3 bedroom with a full basement studio. Needless to say a lot of tools and supplies will have to go. Bob had a great time teaching in Australia. The students were eager to learn and one class made him a discharged jacket with some of the material they had discharged in class. He plans on wearing it in his future classes. Check back around Christmas. We will be back from California and I will post some pictures from Australia. Looking for a gallery for representation.